Posted in: 1 Pageant Pages, 2 Shout-out-Looks. 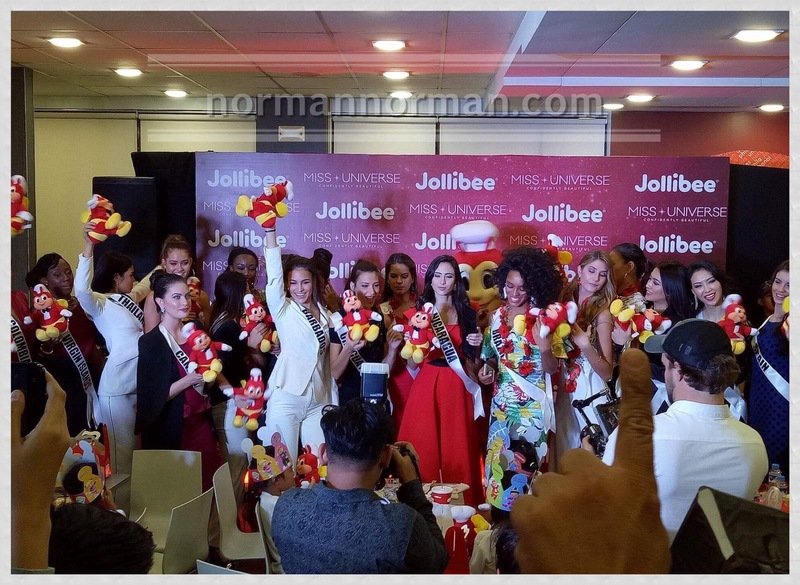 Tagged: 65th Miss Universe, Jollibee, Kezia Warouw, Maxine Medina, Miss Universe. 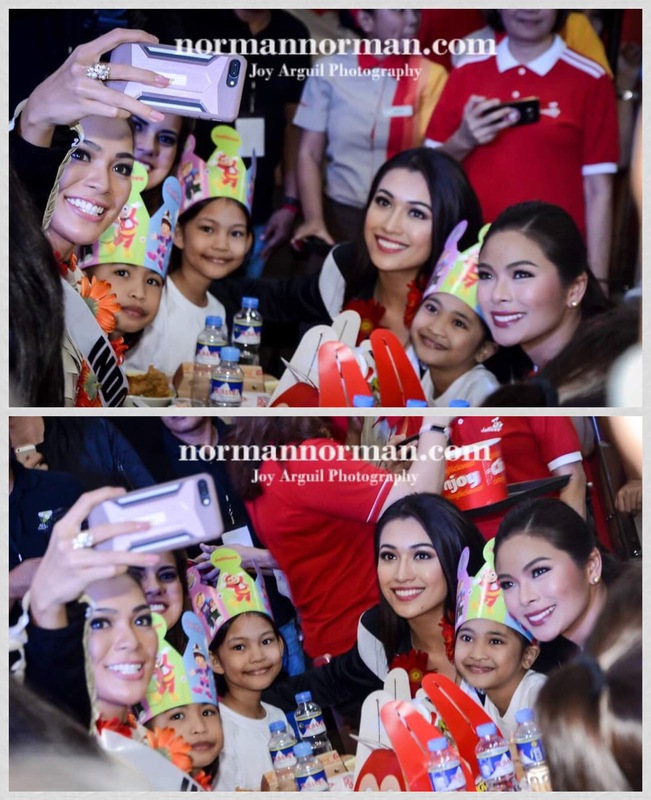 The famous bee just got a little more popular yesterday when the 65th Miss Universe contestants visited the Jollibee branch at Bluebay Walk for a Charity Event with the kids. 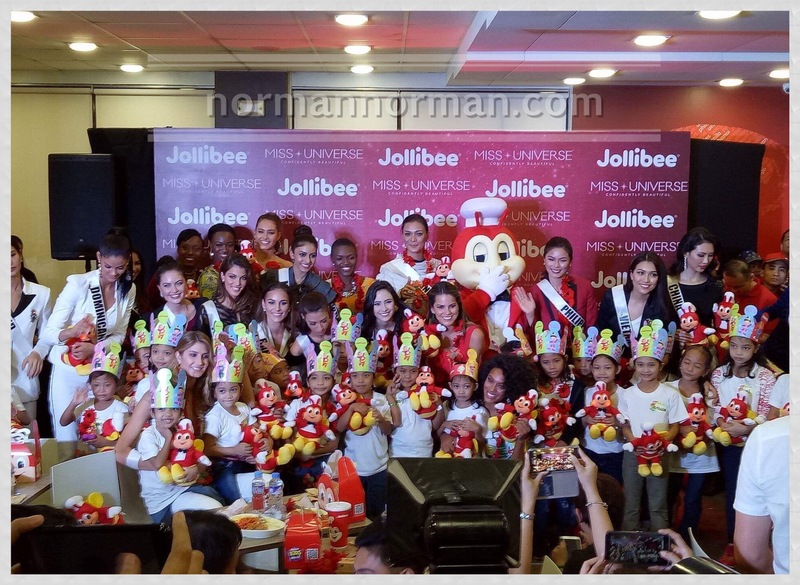 It was a bee-utiful affair indeed as each of the ladies got assigned to kids for some quality time of fun and bonding and eating the best-selling meals at the international fast food chain. 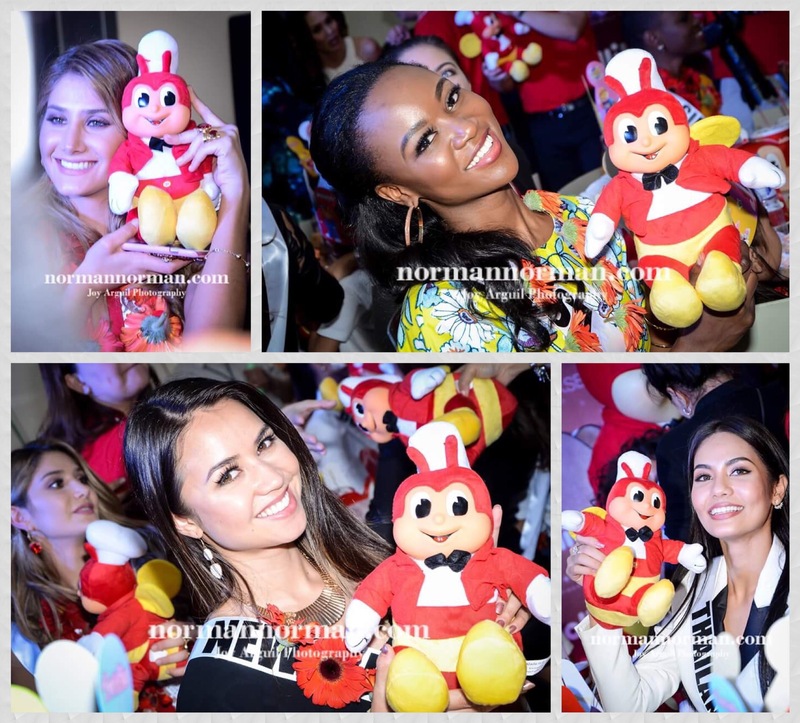 And more than any kiddie parties, this was the afternoon that meant the most to the Official Mascot as he escorted Miss Philippines Maxine Medina at the end of the activity, along with the other delegates who were each given stuffed toys and Swatch watches and party favors handed over by the kids. 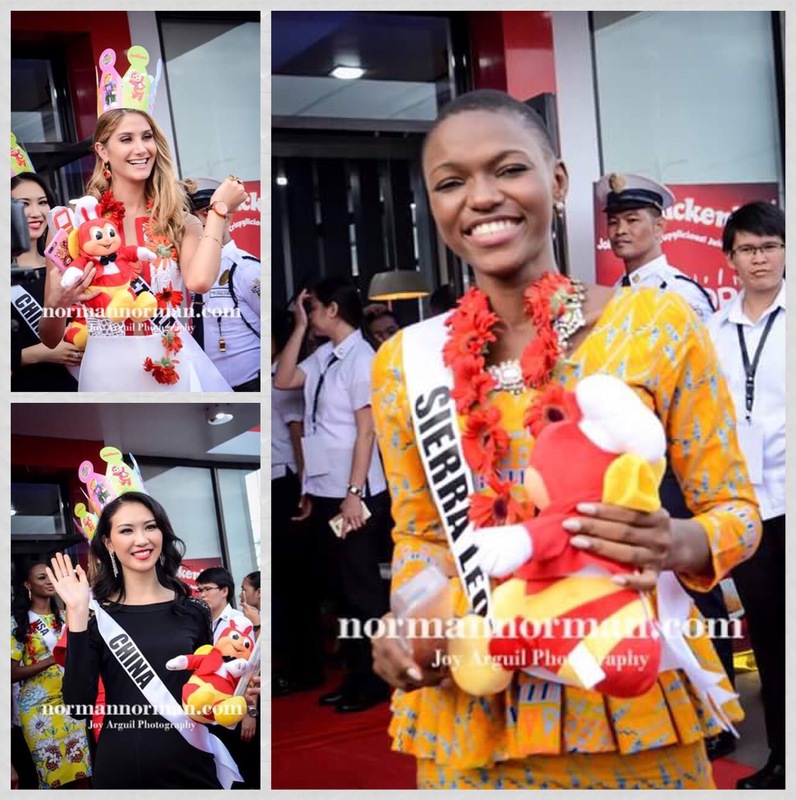 Miss Indonesia Kezia Warouw even had a take-out of Chickenjoy! Mga beks kelan ang NATIONAL Costume vakit parang walang naglalabas ng NC? Hi Laila .. I agree with you. Kezia really needs to learn how to fix her make up. Ako lang ba nakapansin ng maitim nyang pisngi. Di ko alam kung acidic ba si Kezia at nangingitim Ang make up. Parang sinabotahe si Deshauna dito. hihi. Tahimik sya sa competition so far. Oo, di siya matunog… but I won’t be surprised if she gets into the Top 12. Parang nagpabaya sya sa styling. Sa IG nya medyo nagpapahapyaw na pagod na sya. Magaling kumuda pero waley face value. I’d rather go with Sierra Leone who can communicate, who is happy and enthusiastic at wala pang palya sa wardrobe. Probably my fave gown! It’s kinda like a dress but love the playfulness and the details. Brazil finally put her hair down! Love it! Nice legs! Vavavoom! She resembles Solange Knowles. A true test of a beautiful face: no makeup! Here are some of the girls with NO makeup. Miss Germany with no makeup. Love the freckles! Just no. Just say no to Indonesia. I have nothing against the girl or her fans but come on there are more deserving girls than her. Stop hyping a girl at the expense of others who are more deserving i.e. Nicaragua, Australia, and Netherlands. Don’t make MU into MW – it’ll certainly alienate more pageant fans than ever. Why is everyone up against Norman all of a sudden? Based on the posts here, he picked Indonesia to win? If that’s the case then so be it. Maybe he knows more than we do than meets the eyes. We don’t know what IMG’s intentions are but it seems that there’s an interest to keep the crown in Asia. Why? Because Asians have been comparatively more passionate in terms of beauty pageants lately than the Latin countries so there is an opportunity to expand the base. Also, the fact that A&Q and even Jonas (earlier when Kezia just won) posted a pic of her on his IG saying she’s got potential says a lot about how she is regarded in expert’s community. I am rooting for Maxine as I think she is superior than Thailand or Indonesia even in the communications skills but we cannot ignore “other factors” that may be in play come coronation night. In fairness to Miss Indonesia, she’s one smart woman. She majored in an Engineering course and she made an app (and did all the coding) to promote Indonesian tourism. Hahaha.. Oo nga! Point is daming Top contenders this year. Ano ka ba friend!… Fan mo din ako… Ginagaya lang kita sa kaplastican mo.. hehehe 😀 Peace! One classic American beauty. One undeniable Filipina beauty. Super love Miss Venezuela’s sparkling white gown with fringe detail! Very glamourous. The dress is truly stunning but I’m not a fan of seeing the inverted triangle in plain sight (due to no lining from waist down). Hahaha! Kita yung keke ni keke!!! Hallelujah! May mga kakampi pako dito na hindi ma gets anong meron kay Keke anong meron sa blogger. Kinakabahan ako, baka makuha ng Indonesia ang first MU crown nila as PH achieved its first MW title…. huwag naman sana. mas maraming deserving sa kanya IMHO. wishing that this is all hype for her. MUO is known for giving the crown to a stunning lady. Yung tipong konti lang mapipintas mo face wise, maganda talaga. If you look back to their last 6 winners, between the last 2 standing, it was given to the one na mas maganda face at aura. I know he is entitled to have his own fave. But i couldn’t see what he see on Keke. Its kinda weird kasi that he is pushing another country’s bet. I mean Pia might not had been his choice last year for the crown but I know he is supporting her. This time, its kinda weird. I hope you are wrong Tito Norms. Money talks. Aminin Norman. From my reliable source. Oh yeah, you’re right. I went back to his December 2015 post, and he did place Pia as 2nd RU. Vietnam (ligwak beauty) was Top 5. I don’t get the Indo hype either. She is a hit or miss for me. A lot of other much much much better women in this batch. Kung hindi lang din si Maxine, sana si Brazil na lang. Mariam is also much acceptable over Kezia. Even Thailand. Anyway, my sentimental fave is Malaysia. I hope she shines during Prelims and Finals nights. Curacao is also gorgeous. Malaysia was stunning in her gown. Love Malaysia. Face pa lang, kabog na. Nilalamon lang kasi siya nung iba pag sabay-sabay na. Hope she steps up her game. She seems smart and self-assured, kelangan lang nya makipag-agawan ng spotlight. Nabayaran si Norman Tinio ng Indonesia? Baka magjudge na rin cya sa Miss World next year in Indo? hahaha ok lang yan. Business is business. Hindi ba obvious? Nasa payola ng Aces si Norman! Sus, di pa kayo sanay mga bakla, pag Binibini mega hype sa mga merla ng Aces, puro Aces puro Aces? O di ba si Kekendisia sa Aces nag-train? Siyempre gusto ng Aces siya manalo dahil alam nilang IMPOSIBLE na manalo si Maxine, kahit I-transplant mo pa ang kuda ni Tere, Shamcey o Janine sa kanya, waley, di siya pwedeng manalo alam natin yan. It’s okay to root for someone who is truly beautiful in every sense of the word. But to be frank, Indonesian girls before and in recent years are not really beauty queen material. They are not in the same league with the powerhouse of beauty pageants at all no matter how they try to be such. The mere thought of letting Indonesia win and place as runners up, even if their representatives are not really that beautiful and stunning, is nothing but disgusting. Don’t try to insist to make us believe that they are when obviously these ladies are still very, very far behind, They are yet to discover someone who can best represent of what we call a lady who is quintissentially beautiful. It they can do so, I would be one avid fan of her. nakakaloka nga si norman lately. his super liking for indonesia makes me wonder, bakit. ok lang kung si thailand pero indonesia? notwithstanding the indog fans, i dont really see what norman sees kay keke. wag masyado paobvious madam. Kasi nga BAYARAN ng ACES. Keke train kila Jonas. Kaya kung di pwede si Maxine manalo dahil di pwede back-to-back sa host, eh di si Keke na lang. Voting time mga kababayan. PH all the way!! First, I want Maxine to win. And I am full support to our Queen. But i just want to give 1 critic which I hope will reach her. Maxine has one if not the most beautiful face in the competition. No bad angles at all. Even if the gowns or outfit that she wears are not the most bonggacious one, in a way she manage to stand out due to her Beautiful face. However, I noticed lang during fashion shows, even though she has a beautiful walk, when she pose in the middle parang may kulang. Facing the camera ha. Yu g back pose naman kasi looks divine. Pero yung facing the camera, hindi mukhang fierce. Hindi ganun ka powerful like what Vene or Thai are giving. I hope she can improve. Parang dito. My eyes look straight to Chalita. Lea! Same here but.. I think she’s just starting. I believe sa prelims, magpapasabog siya. dun niya ilalabas lahat. feeling ko yun ang game plan nila e. kasi kung ginawa niya yun ngayon, wala na siyang ipapakitang kakaiba sa prelims. sana nga ganon. I wonder what she would wear as her evening gown? 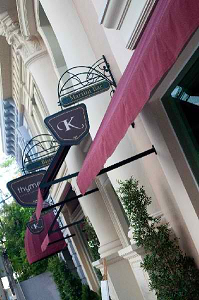 @MrManila, I am hoping the same. But I wish she should start pushing now. Few days to go.. Remember, ang pasabog pose ni Janine sa finals night, ibang iba sa prelims! and that’s a #fact. or is it? Looks like Miss Indonesia is gaining ground as far as exposure is concerned. Miss Thailand is very sweet and likeable. These 2 plus Maxine are the Asian frontrunners, imho. Ginagawan lang nila ng way na ma-bash si Maxine. Naintindihan ko naman ang sinabi niya. Okay na yun. I don’t see any problem with that at all. Maxine did great! Yes, you can see that she is a bit uncomfortable … BUT there is NOTHING wrong with that! This is normal when you’re in front of a crowd. And she made it through and got to say what she wanted to say. And she kept on smiling. Maxine has definitely improved and this is what matters. She did her homework. Give her a pat on the shoulder. She did great! And before you guys bash Maxine … why don’t you try it for yourselves to be IN FRONT of a large audience and come back here in the comments section. And let us know how it feels like and show us the video on how you handled the crowd. Oh god lets all admit that this stint looks painfull but I know she will do better than Indonesia and Thailand so hopefully she shows more confidence in delivery in the following days. Umuulan ng keke post samIG ng Lola nyo. 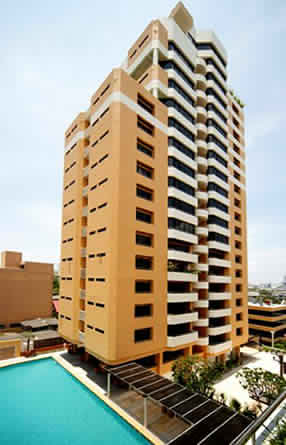 Kaloka. In fairness naman she’s getting better. I wonder if that was strategy to not look great in the beginning to show some “transformation” come finals night. Bet talaga ni Tito Norms si Kezia na manalo. Pati ‘yung ibang beks na may blog, bet nila si Indo. 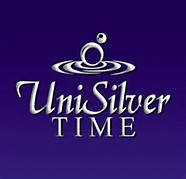 Watch ka ng Bottomline next week. I don’t know what they see that we cannot see in Kezia! Last year nagduda si Tito Norms kay Pia. Pang-third lang si Pia sa kanya, and look at Pia how she emerged the winner. I’m going to say that Kezia could win because of momentum. Indonesia has fared really well in the pageants this year and that carries over to Miss U. They are so called “The darling of the pageant world” at the moment. The country is being talked about all the time and that generates plenty of buzz for their candidates. And given this new enthusiasm and potential market for Miss U and birth of new Asian rivalry, IMG would be smart enough to actually hand Indonesia the victory. Sinasabi ko na nga ba eh… Haist. TRUE! LOL everytime I check puro si keke. I know who is his bet. Seriously speaking, hindi ko talaga makita ang nakikita nila sakanya. About the no make photoshoot lahat ba sila meron nun? Oh no, pano na ang nose line ni Keke! Charot! Popmpeii, I don’t think lahat meron. nakakainis nga e. sana lahatan na. nakakasad din na walang glam shots, swimsuit photos, evening gown and everything. Yung no makeup photoshoot na yun sa sponsor yata yun. Sayang talaga..inaabangan ko nose line nya charot! :) about the glamshots, bakit nga ba wala? alam na! naloloka rin ako. Liyad kung liyad ang Venezuela. Parang maldita ang dalawang vaks at si Maxine and anghel. As predicted MISS CANADA has now made her “weight gain” an issue on Instagram, As I’ve mentioned before, this was her strategy all along. This was MISS CANADA about 14 months ago. She was 1st runner-up at Miss Supranational 2015. This is her at the recent Cebu swimsuit presentation. It looks like her weight gain was planned. And I don’t think it’s a coincidence that Ashley Graham, another plus size model, is going to be the commentator for the live telecast. What does IMG have in store for the finals? Does this mean Miss Canada might have a straight shot at winning the title, and ANOTHER CONTROVERSIAL CROWNING for Miss Universe — just like the last time? Nako Isa pa to. She was one of my bets before tapos sasabak sya SA pinaka mabigat na pageant na ganito? Tapos biglang may advocacy na sya to love yourself ek no matter what shape or size you are? Buti sana Kung noong unang sabak pa lang nya ganyan na sinasabi nya. Eh ngayon na naououna sya biglang cambio. Minsan kairita lang….Kung tumaba ka oh edi sige tumaba ka pero kung ganyan kalibre na ng pageant sasalihan mo mahiya ka naman sa mga Kasama mo na nagbtrabaho para magkaroon ng healthy lifestyle and fit physique Hindi Yung I sa psych ek ek mo kami na tanggapin ganyan body shape Kase politically incorrect na ngayon na maging vocal on someone’s obvious weight gain. She wants to be the token fat girl… dahil maganda ang resume ni Canada… Pagbigyan! I think, and I’m afraid, that IMG will have Miss Canada as the token fat girl as one of the semifinalists (or worse), thereby denying more deserving girls that chance simply because they’re not fat! Ba’t palagi siyang nagmamadali? Yun ba ang normal pacing Niya? Akala ko ako lang nakpansin Nung mga IG post Marami rin Pala. So, the pageant is now about the “hype” and not on the merit of the performance of the girls? Bong! Hahahahaha! Kaloka ang tidbits. Aruba is slaying the competition! I have to say Kezia’s styling is getting better and better and she got a good gown for the fashion show. I love Max’s blazer for Duterte’s courtesy call. Maxine’s styling has always been on point, while I seldom spot Kezia’s. Ana I agree with Maxine. I don’t think she’s ever had a bad day. I see a lot of Kezia on IG. Her fans are really pushing her to be on feed all the time. hihi. ok lang yan at least daming enthusiastic at mag aabang for the coronation night.